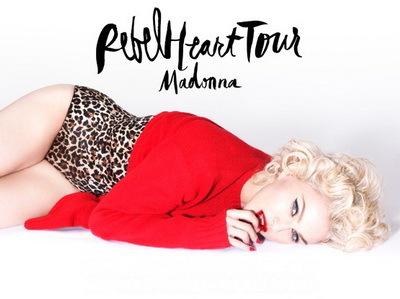 Rebel Heart Tour has been the tenth worldwide tour by the ever so popular American legendary singer, Madonna. The songstress has released 13 studio albums so far, the latest in line being Rebel Heart. The tour commenced on September 9 of 2015 and ended on 20th March, 2016. The tour just like Madonna’s awe-inspiring career has been pretty successful. The first show happened at the Bell Center in Canada and then she along with her crew travelled though North Africa to Europe, Asia, Oceania finally giving her last but not the last performance at Allphones Arena in Sydney, Australia. Throughout the whole year of 2014, Madonna was engrossed in making her 13th studio album, Rebel Heart. The initial plan was to start the tour on August 29, 2015 but it got delayed. This was the fifth time that Madonna collaborated with Live Nation Entertainment’s Global Touring Division to perform worldwide. The tour did exceptionally well all over the world and the crowd roared with excitement for her. Her Australian fans had been waiting for her tour for years and so they got an extra show by Madonna, named as “Tears of a Clown”. The show was one of its type which showcased a fusion of comedy, art, and music. The price of tickets for most of the shows was set $300-$350 at tops with the lowest price being $35. Her Manila performances though were pretty expensive as the lowest price for the tickets was $70 while they rose up to as much as $1300. According to Forbes, Rebel Heart Tour was the most expensive tour of 2015 as the average price of a ticket was valued at $452.33. It is noteworthy here that the average price of tickets for Taylor’s much celebrated The 1989 World Tour was comparatively pretty low as they valued at merely $305.21. When Billboard revealed the boxscores of the first 10 dates of the tour, it showed a total of 132,769 tickets sold with a gross of $20 million. The shows held in New York turned out to be the most grossing and successful shows of the tour as they had a gross total of $5.2 million. Madonna has crossed a billion gross with her Rebel Heart tour and is now ranked at number three on the list of all-time top-grossing Billboard Boxscore; U2 and The Rolling Stones are ahead of her. The pop sensation was 4 hours late for her show in Brisbane which absolutely made the crowd angry. Not only that, she seemed pretty drunk while singing; a video surfaced on internet in which she can be seen stumbling. While performing on stage in Brisbane, Madonna called out a fan on stage, spanked her and also pulled her top exposing her breast to the big crowd. The Sydney shows of Madonna’s performances will be released as her tour DVD in the near future so gear up if you haven’t attended the concert, you can still get the taste of Rebel Heart tour.